What causes clogged pores and how bad they can be? You are here: Home / Beauty Tips / What are clogged pores and what they can do to Your Face? The skin is the largest organ of our body and it has tiny openings on it. It is through these openings that oil or sebum from the sebaceous glands comes to the surface of our skin. It comes via hair follicles and these hair follicles grow from these tiny openings itself. The openings extend downward from the epidermis of our skin to several layers of the skin below. These openings can get clogged due to too much secretion of sebum or with dry and dead skin cells. These also get clogged with normal every day dirt and filth. These are what clogged pores are and it is really important that you keep these openings clean, as clogged pores usually would lead to blemishes and acne. Maintaining a good skin care regime can go a long way in keeping these openings free from dirt or grime and can help in preventing formation of blackheads and acne in the future. Having clogged pores is something that is very normal and there are many reasons behind it. There is no fixed age for your skin pores to get blocked. However, most men and women face this predominantly during their puberty. During puberty, there is an increased secretion of various hormones in your body and this stimulates the secretion of more sebum. Hormonal changes also occur during the menstrual cycle and pregnancy and these can also act as triggers. Certain types of cleansers, cosmetics and lotions can also encourage blocking of skin pores. Avoid using too much of anti-wrinkle cream as this might lead to clogged pores as well. Why are clogged pores bad for the skin? Once your pores become clogged, your skin is unable to breathe. The flow of oxygen and carbon dioxide is hindered. Oils are secreted but waste products are not excreted. The pH balance of the skin is disturbed and your skin is unable to absorb the required amount of moisture. This leads to the outbreak of acne, blackheads and pimples. Every hair in your body arises from a pore and although we cannot see each one of them, we can see quite a few. It is important that you have unclogged pores on your skin as it is a prerequisite for a healthy and glowing skin. It is also required as the accumulated dirt if not cleaned, bacteria will soon find their way into your skin. This can lead to inflammation as well. There are millions of pores on your skin and each of these has abundant hair follicles as well. The terms pores and follicles are used to refer to the same thing and if you are still unsure as what clogged pores are, then read on. You can consider the follicle to be a chimney and the pores of your skin to be its opening as that is exactly what it is. Skin cells die every day inside the follicles and sebaceous glands also produce a lot of oil called sebum. Sebum is nothing but a mixture of proteins, fats, cholesterol and inorganic salts. This mixture travels through the follicle and escape through the pores. As it escapes, it also carries the dead skin cells along with it. Sweat is secreted from sweat glands and that is different from the oil producing glands. As sweat emerges out of your skin, it gets dried up, but it leaves behind salts and these salts can clog your pores as well. The mixture of dead and dry skin cells and oil acts like a protective layer and protects your skin from bacteria, wind and rain. However, too much of these can block the pores and the things inside are unable find an outlet and get cluttered. This leads to acne. This can also lead to pimples and blackheads. This is what clogged pores are and what they can do to your face. Now, let us see how to get rid of and clean these clogged pores. You can unclog the pores of your face with the help steam. Do not scrub as that would make your pores larger. If you are wearing makeup, then use baby wipes or makeup remover solution to clean the makeup. Make sure you remove all traces of eyeliner, concealer and every other make-up. Use lukewarm water to clean your face. Later wash your face with a gentle face wash if you want to. Dry your face with a soft towel. Then boil a pot of water and you can add some essential herbs to it as well. You can add tea tree oil for treating acne. Lean over the hot water by placing a towel over your head so that the steam does not escape. Wash your face with cold water to finish off the process. Apply a light moisturizer in the end. Use a makeup remover if required or wash your face with a gentle face wash and pat it dry. Then use the brush to brush your face in small circular motion. Concentrate on areas where your skin is the driest and also on the skin around the eyes and lips. Wash your face to finish of the process. Now it is time to keep your skin clean! 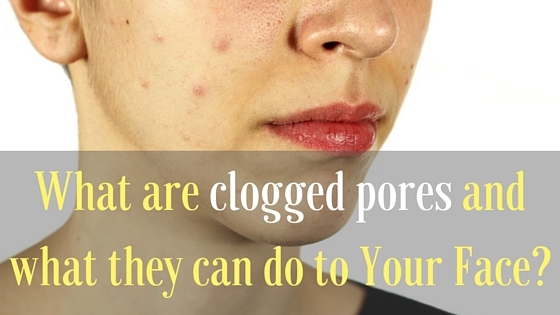 By now, you possibly have a clear idea as what clogged pores are. Make sure that your face is clean and hydrated to prevent clogging of the pores. Also exfoliate your face and use a facial mask every day to keep it clean and nourished. Hi Jane, will mineral oil clogged pores? SHould I do the steaming everyday? Can clogged pores of 10yrs disappear through steaming? Yes. You will have to do it consistently.